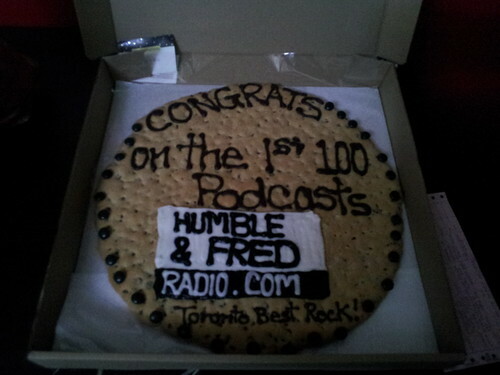 I spent the afternoon at Redfish studios for the recording of Humble and Fred's 100th podcast and a little celebration afterwards. It's hard to believe the guys have 100 shows in the can already. 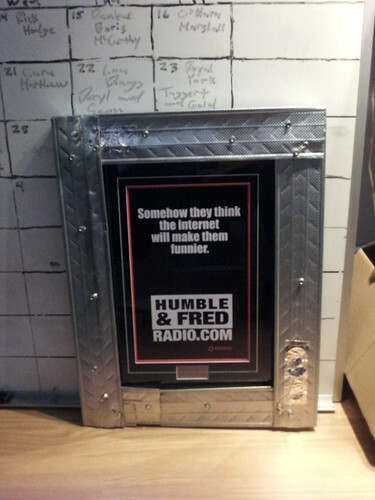 I first teased this little experiment on August 4th, 2011 and sat down with Humble and Fred on August 16 to hammer out the details. On September 6th, I spilled the details here. 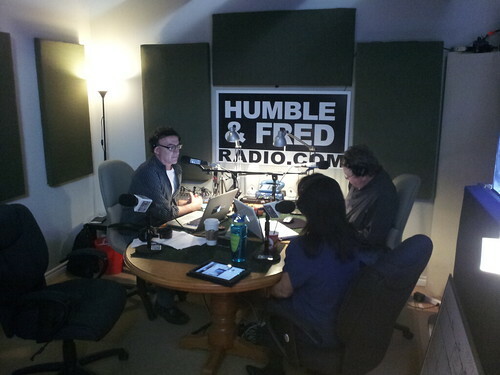 Without a traditional radio station gig, Humble and Fred would record their own podcast daily and share it digitally with the masses. 100 episodes later, they have an unprecedented deal with Rogers, actual sponsors paying real money and, most importantly, content that keeps me tuning in day in and day out. In addition to an assortment of well-wishers, there was a very large cookie. I took home the leftovers and my kids couldn't be happier. Julie Adam was there from Rogers to present this gift from the Rogers empire. Congrats, guys... I'm looking forward to the one year anniversary party in October. I am definitely going to that one. For sure! I've listened to every podcast, and am currently right up to current shows. The guests have been a great mix with artists I never would hear anywhere else, the banter back and forth, and the fact if they have a really interesting guest on, they can just toss the crib sheet and continue on. No interruptions for traffic, news etc. just makes it all the better. Congrats Guys, Kelly, Kinga and the rest of the regulars for 100 great shows! Two thumbs up guys...keep up the innovated work! TBH I never listened to Humble and Fred. That being said, Podcasts have exceeded the quality of terrestrial and satellite radio. I listen to a few Podcasts such as Joe Rogan Experience/Nerdist and nothing compares on the radio. Truly, it is a medium where creative personalities can have complete control over their content. Radio will never die but Podcasts are the better version of it now. Congratulations...Unfortunately, technology, time & opportunity prevents me from listening to the shows on a regular basis. They seem to have some form of backing from Rogers. Is there any possibility of a regular live broadcast? Or is this part of an exeperiment that Rogers is conducting?